In my books, I'm trying to tell good stories that have meaning — and that connect with young people's real lives today. My writing for young adults is based on listening to them, which I try to do often. Along with The Revealers, I have written 11 other books for young readers — and my sequel to The Revealers, called True Shoes, is being published this December 1. (Click here to learn a lot more.) I live in Weybridge, Vermont, have a 24-year-old son and a 15-year-old stepson, and am a full-time, self-employed writer. The first thing people often notice about me in person is that I'm very tall. I'm six foot ten! When I visit schools, this always causes a stir. I was born in 1952 in Portland, Oregon, and moved to suburban New Jersey when I was in kindergarten. All through elementary school I was an avid reader. Suddenly, in middle school, I began to write. I was writing stories, poems, even a play. Until then, I hadn't been good at much of anything — I was tall, skinny, awkward, and not very popular — and it made a big difference to feel that this was something I could do. Like the main characters in The Revealers, I was bullied a lot in middle school. The idea for the novel grew, in part, out of my own experiences. To read about that, go to The story behind The Revealers. I studied English and played basketball at Kenyon College in Ohio, and after graduating I traveled by land from Europe to India and Nepal. It was a great adventure, and I dreamed of going back. After working as a newspaper reporter and editor back in New Jersey for several years, I did return to Asia, to spend time talking and listening with young people who were Muslim. I wrote a book about my experiences, called Street of Storytellers — but no one would publish it. It was rejected about 75 times! In those years I learned how challenging it is to be a professional writer. I kept at it, moving up to Vermont and earning my living by writing articles, newsletters, brochures, and things like that for all kinds of organizations. My son Bradley was born in 1987. His mom and I were divorced a few years later, but we stayed good friends. I'm very proud of my son, who's now a tall, strong, kind young man in his first year of law school. In 1992 I was asked to write a science-fiction novel for "Choose Your Own Adventure," a popular series of interactive fiction for young readers. I went on to write eight "Choose" books, and I learned a lot about writing stories that could keep young readers turning the pages. After leaving the series, I wrote two novels for young adults — and the first one, Raising the Shades, was published by Farrar, Straus & Giroux in 2001. It's the story of a boy who is trying to cover up his dad's alcohol and drug problem, but finds he can't ... and maybe he doesn't want to. 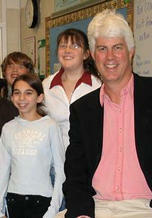 Raising the Shades was nominated for the 2004-05 Indiana Young Hoosier Book Award. The Revealers came out next, and has been strongly received by young readers, teachers, librarians, guidance counselors, parents, and others. Hundreds of middle schools — all across the U.S., even internationally — have used my book to open up discussion and awareness of bullying. Young readers across the country nominated The Revealers for the 2004 Teens Top Ten list of the American Library Association; it was nominated for five state young-reader awards; and it is the middle-school selection in the Anti-Defamation League's curriculum project, "Words that Heal: Using Children's Literature to Address Bullying." What has meant the most to me has been hearing how much the book has meant to young people who often feel, as I did, lonely and isolated in their lives. I couldn't ask for a better reward than that. In 2007, my YA novel Falling was published by Farrar, Straus & Giroux. It’s a realistic story, about a year above The Revealers in characters and subject matter, that’s suitable for both middle and high schoolers as it also deals with some of the real issues that young people today often face. Many readers have let me know they’re passionate about Falling! And in 2009, Scholastic published my first non-fiction book for young adults, Alexander the Great: Master of the Ancient World, an illustrated biography in the Wicked History series. This October, Chooseco is publishing my first new "Choose Your Own Adventure" book in 13 years. It's called The Curse of the Pirate Mist and involves treasure-hunting, pirate legends, high technology, World War II sea battles, and more. Most exciting is that True Shoes, my new sequel to The Revealers, is being published this December 1! The new novel involves almost all the same characters, plus some new ones in an adventure that I think readers will find gripping and true to life in this time of text messaging, Facebook, YouTube, and so on. For an interactive inside view of the publication process, please visit (and "Like") my new Facebook page for the book. In autumn 2009 I was married for the second time, very happily. My wife Cary is a therapist who does wonderful, healing work with young children and adolescents. My stepson Nate is a middle schooler who plays center field and has a black belt in tae kwan do. My son Brad graduated in 2010 from Union College, where he majored in international relations and Chinese, and is now a first-year student at the Earle Mack School of Law of Drexel University. 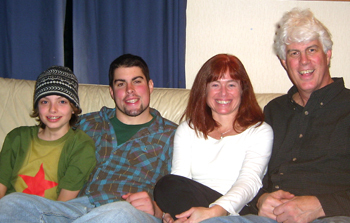 My family and I live in Weybridge, Vermont, a beautiful small town near Middlebury College. Along with writing, I enjoy playing music (I play conga drums and harmonica in a band called The Avant-Garde Dogs), gardening, reading, walking, baseball, my family, and my home. I often visit middle schools all over the U.S. that are reading The Revealers. I enjoy these visits very much! Middle schoolers are fascinating to me as they struggle through what is, for most of them, the most critical, intense period of change and self-discovery in their lives. To write for young adults is a privilege and a constant, creative challenge. I’m grateful for the chance, and I hope to keep on writing these books for a long time to come. 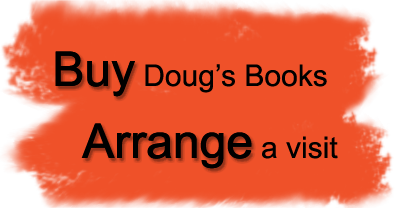 For a complete list of Doug Wilhelm's books for young readers, click here.